If you’re talking about the stand alone versions of the Despecialized Editions, the only newer version is 2.7 of Episode IV. Use the steps in “The Ultimate Introductory Guide” and the links found here for it. If you are talking about the NJVC releases, follow the steps in the first post of this thread. Bryce and mccann98, awesome and awesome. BTW, Bryce, you did say you were using a mac. No omissions as far as your post went. However, I was unaware one needed to use the command prompt for winrar on macs, or really that winrar was even available for macs in the first place. I’ve never used macs. That shortfall is mine. Trust me, my computer skills are perhaps slightly above average at best. I do now see that this site mentions it, but only in a note about half way down the page. I’m glad you got it to work and I will keep it in mind that Winrar has no GUI on Macs. Another thing, just so you guys (Bryce and mccann98) know. 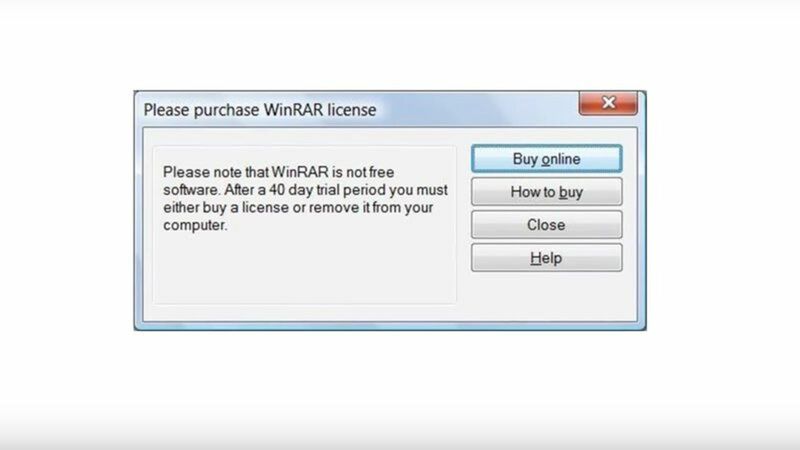 Winrar is effectively free. It has a forty day trial after which a window will pop up that looks like this. But all you have to do is click close, and the program will continue running fully functional for free. Here’s an article that explains why this is. Also, do you guys know how to verify a file’s checksum? It’s a fairly quick way to check if a particular rar might be corrupted, and especially if you think a particular file might be causing the problem. Let me know if you would like to know how to do that, and I can help you run those tests if you like. Here’s a link that might help getting the files extracted. Mccann98, that link might be helpful for you as well, but you might also just try some other extractors like Winrar or Peazip. I did not knew about possible lawsuits . By making the Original Unaltered Star Wars Trilogy available in High Definition in any form, technically, those involved at originaltrilogy.com are breaking copyright law. However, what we are making available is material that the copyright holders refuse to sell. Since we urge that those who want copies buy the commercially available versions first, and to not sell the Despecialized Versions, in theory, none of this has any financial impact on the movie producers. But there isn’t any legal protection for these projects at all. The studios are looking the other way, but only because they choose to look the other way. They could easily shut everything down if they changed their minds. We want to do everything we can to make sure they don’t change their minds! That’s fine. No problem at all. I had to learn a lot of this myself when I discovered these versions a few years ago. Plus, I am a very patient man. We will take it step by step. All of the steps to get the NJVC blu-rays are in the guide I posted here. Let me know if a step is confusing, or if something I say as we talk to each other is unclear, and I will do my best to help make things more understandable. Trust me, if you have a computer with good internet speed, you can do this. You’ve already proved you know how to use a computer and a web browser just by posting here. And I can talk you through anything else that might be confusing. One last thing. I would suggest that we continue this discussion in private messages if that is okay with you. That way we won’t add stuff that gets in other people’s way on the main threads. I’ll help you troubleshoot if you are willing to post back and forth, either on my guide thread or by sending private messages. Downloading the blu-rays can be difficult. But please … do not buy anything that someone else has burned or ask anyone on this site to burn the discs then mail them to you. The biggest reason Fox, Lucasfilm, and Disney tolerate Despecialized Editions is that nobody makes any money from them and the users of this site do not physically distribute them. Selling or mailing discs would cross that line and put this site at serious risk of lawsuits. However, I can help talk you through the operation. What is the first step from my guide that is confusing you? I wish I could say that I noticed it because I spoke French. Or even because of the two semesters of French I took in high school a certain number of years ago that’s beginning to be to high for my liking. Alas. I can only claim to know how to translate on Google. Last time I checked, files on wetransfer.com are deleted after a week. It’s meant to be used temporarily for transfer, not long term for storage. Also, the mega.nz terms have changed. Accounts that are grandfathered-in still get 50 gb free, but new accounts only get 15 gb free. Anyway, on another note, I have an idea, though it may not be a good one. In addition to the the totals of the current donations, and how far into the immediate future they’ll get us, hypothetically, is there also a way to give some indication of projected funds totalled from future monthly gifts, or even just the number of individuals who are giving monthly donations? I ask because I think that getting a certain critical mass of repeating monthly donations will likely be what will make or break this site. Let’s say person [A] is thrilled by the restoration work going on here and donates $100, but does so once and disappears. On the other hand, let’s say persons [B], [C], [D], [E], & [F] can only donate $1, but can all do so every month. In less then two years, together, they would out-donate person [A] because they would be focusing on supplying sustainable revenue and not flash in the pan giving. Most people, like me, probably can’t spare a large amount in the immediate future. But most can probably spare a tiny amount repeating. And all it would take would be a handful of people who are donating like that monthly to sustain the site indefinitely as long as they continued to do so. So is there a way to indicate not only immediate funds, but also what’s pledged down the line, or even just the current number of people have reating donations? All that said, that might be way to complicated to do with just one power up indicator. Perhaps have two? One with the monthly goal of $75 that has to be reached each month, and another that totals all the monthly donations that are currently pledged to be ongoing, so people have a rough idea of what the ongoing monthly shortfall will be? Or maybe all the indicator ideas above are just not worth the trouble? But if the laser represented the growing dollar total of donations, once funds were raised, wouldn’t that make it seem like the Empire had succeeded? And for what it’s worth, I’ll kick in a dollar a month. Hey, some good news for this thread for once! The wretched hive of scum and villainy that was ldsentertainment seems to have shut down! Didn’t even think to mention that. I’m not terribly technically proficient, but googling “I/O Error ScsiStatus: 0x02” turns up some mentions of outdated drivers in the help forums. You could check to make sure your drive’s firmware is up to date. Here’s a YouTube video to help with updating the drivers made specifically with imgburn in mind. There is also mention of making sure your drive is free of dust, and making sure you got name brand Verbatim discs and not imitation ones. Another thing to keep in mind if watching from your computer is an option: it is possible to watch the ISOs as if they had been burned, but without using a disc, by mounting it as a vitual drive. The last part of step 10 in the guide in the first post of this thread addresses this. I posted about it here. You can get it free for PC here or free for Macs here. I’ll be glad to help out, but you’ll have to be more specific about what the problem is. All the links you’ll need are available if you follow the instructions in the first post of this thread. Beyond that, I don’t understand what you need. Morannon, I probably won’t be much help, as I have nearly zero experience using Macs. But if you post a screen shot of the error, someone else reading this thread might be able to help. Do you know how to take a screen shot of the error and post it here? Harmy's THE EMPIRE STRIKES BACK Despecialized Edition HD !! !MKV and AVCHD v2.0 NOW AVAILABLE!!! Hi ogpearl, welcome to the forum! You won’t find direct download links anywhere on this site. Direct links would cause too many copyright issues. Follow that guide and you’ll find what you seek. Hi irishmike, welcome to the forum! Those are the stand-alone films as MKV video files. They are available using this guide. The release discussed in this thread are the exact same files, just with menus and special features added for burning to Blu-ray. You can find the directions for obtaining the Blu-ray versions in a guide I posted here. “ISO files are the digital images of the videos and file structures to be burned to the blu-ray disc, but it is not necessary to burn the ISOs to discs to view them. You can mount the file as a virtual drive to have your computer view the file as if it were a disc in a drive. Here is an article on how to do that in Windows. The process is even simpler in Mac OS”. Best of luck to you and let us know if you need anymore help! It’s all good! Glad to help! The 25 GB discs have a few less audio track options. Every thing I would be able to tell you is in NJVC’s initial post here. I don’t know if there are are any designs meant specifically for a set using the 25GB discs. But I’ve had success playing around with the disc and cover designs already posted using other various artwork from this site, plus stuff you can find on fanart.tv. You can then use Gnu Image Manipulation Program (GIMP, which is free), to create your own homebrew covers and disc art if you don’t find any to your liking. Take a spin around the fan art section of this site and you’re sure to find lots of ideas. OK, I’ve re-uploaded the files, updated the download link list and the faulty link log, and sent PMs with the new links to those who inquired. To racerx135, Morannon, and vt4000, I’ll see if I can get those faulty rars re-uploaded today, but no promises, though. It may be a few more days before I can get to it. To Pitpawten, I don’t know if there are are any designs meant specifically for a set using the 25GB discs. But I’ve had success playing around with the disc and cover designs already posted using other various artwork from this site, plus stuff you can find on fanart.tv. You can then use Gnu Image Manipulation Program (GIMP, which is free), to create your own homebrew covers and disc art if you don’t find any to your liking. Take a spin around the fan art section of this site and you’re sure to find lots of ideas. Also, I would also love it if anyone who might have any ideas why my links have started randomly failing would post their thoughts here. I’m puzzled. Might be a day or two, but I’ll check into it as soon as I can. Can somebody please help me? The Link for the Star Wars Documentaries.part20 wont download. I have been trying for 3 days. The others 25BD links are perfect. Sorry for my english i’m Brazilian. Thanks in advance!!! yurioberg09, were you ever able to get the Star Wars Documentaries.part20 downloaded successfully? It has continued to be functional on my end, unlike some of the other links that have been mentioned. Are you still having trouble?